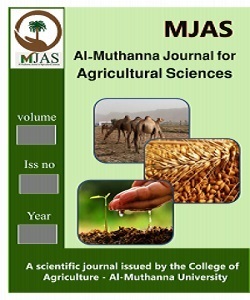 The study carried out in the laboratories of the Department of Plant Production in the College of Agriculture / University of Al-Muthanna in the year 2013 and the study included the impact of technology on the magnetic Hgeni tomato seeds LycopersiconesculentumM. And two hybrid Super Rejina Trascantos and hybrid seeds and the treatment of magnetic technology in different ways included : in-line vertical seeds , seeds for the horizontal direction , vertical and horizontal combined , dowsing for water magnetized (30 and 60 minutes) and the treatment comparison. The dish complete randomization design (CRD) and four replications were compared according to the test averages L.S.D at The possibility 0.05 . And can be summarized as the most important findings of the study as follows: - Hybrid Super Rejina outweigh the moral Hybrid Trascantos in the percentage of germination and speed and an increase of ( 17.06 , 3.17 %), respectively . While the superiority of hybrid Trascantos in the intensity of the effectiveness of the peroxidase enzyme on Hybrid Super Rejina (28.26, 27.12 and absorption units / g ), respectively . The best germination percentage was soak the seeds for the treatment of magnetized water for 60 minutes compared to the treatment and comparison , which reported the incident to ( 95.61 , 67.43 %), respectively . The lower the effectiveness of the enzyme peroxidase in Almaamlhmathowbulgt 21.42 unit absorption / gm . Outperformed all transactions of the magnetization of the seeds of moral treatment comparison in the speed of germination and the highest was for the treatment of magnetized Albdhurbalme soak for 60 minutes compared to the treatment and comparison , which reported the incident to ( 9.01 , 12.01 days ), respectively .نفذت الدراسة في المختبرات التابعة لقسم الإنتاج النباتي في كلية الزراعة / جامعة المثنى في العام 2013وتضمنت الدراسة تأثير التقنية المغناطيسية علـــــــى بــذور هجينـــي الطماطةLycopersiconesculentumM. و هما هجين Super Rejina و هجين Trascantos ومعاملة بذورها بالتقنية المغناطيسية بطرق مختلفة تضمنت : بالإتجاه العمودي للبذور ، الإتجاه الأفقي للبذور ، العمودي والأفقي مجتمعة ً، التغطيس بالماء الممغنط لمدة ( 30و 60دقيقة ) ومعاملة المقارنة . وطبق تصميم تام التعشية (C.R.D ) وبأربعة مكررات وقورنت المتوسطات وفق أختبارL.S.Dعند مستوى أحتمال0.05 . ويمكن تلخيص أهم نتائج الدراسة كما يأتي :- تفوق الهجين Super Rejina معنويا ً على الهجين Trascantos في نسبة وسرعة الإنبات وبنسبة زيادة بلغت (17.06 , 3.17%) على التوالي . بينما تفوق الهجينTrascantosفي شدة فعالية انزيم البيروكسيديز على الهجين Super Rejina (28.26 ، 27.12 وحدة امتصاص /غم) على التوالي . أفضل نسبة إنبات كانت لمعاملة نقع البذور بالماء الممغنط لمدة 60 دقيقة مقارنة ً بمعاملة المقارنة واللتان بلغتا (95.61 ، 67.43 % ) على التوالي . وكانت أوطأ فعالية لأنزيم البيروكسيديز في المعاملهذاتهاوبلغت 21.42 وحدة امتصاص/غم . تفوقت جميع معاملات المغنطة للبذور معنويا ً على معاملة المقارنة في سرعة الإنبات وأعلاها كانت لمعاملة نقع البذوربالماء الممغنط لمدة 60 دقيقة مقارنة ً بمعاملة المقارنة واللتان بلغتا (9.01 ، 12.01 يوم ) على التوالي .